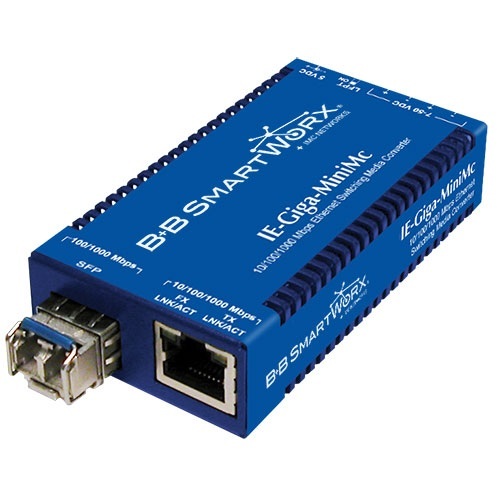 IE-Giga-MiniMc Industrial Ethernet Gigabit Media Converters with LFPT switch are for use in extended temperatures. Media conversion is the most cost-effective and flexible solution for implementing new technologies on legacy wiring plants and equipment. But even reasonably-priced media converters can tack on a substantial sum to networking costs. And space constraints can also be an issue when hundreds of conversions are required. Measuring less than 3.5 inches deep and 2 inches wide, and having both data connections on the same side of the unit—the IE-Giga- MiniMc-LFPT is the industry’s smallest media converter at a fraction of the cost of other alternatives. Link Fault Pass Through (LFPT) can be enabled/disabled via a DIP Switch on the unit, and is a useful diagnostic feature that assists the network administrator in indicating a fault condition on a given segment between the interfaces. With Plug-and-Play, Auto Negotiation and AutoCross operation, extreme operating temperatures (-25° to +85° C), DC or AC power, the IE-Giga- MiniMc-LFPT miniature media converter is easy and convenient to use. SFP port supports 100 Mbps or 1000 Mbps SFPs (fiber). This allows the customer to utilize the product for a Fast Ethernet circuit and later upgrade to Gigabit.